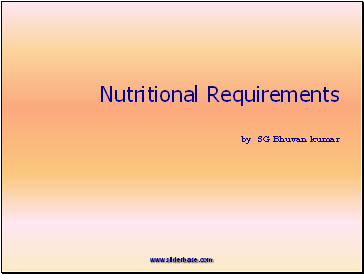 Nutrition means either preparation of food or Supply of nutrients for the release of energy. Some nutrients like carbohydrates, proteins, fats and mineral like sodium are required in large quantities and they are known as Macro-nutrients. 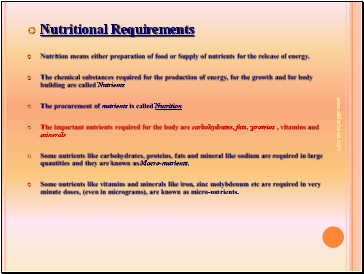 Some nutrients like vitamins and minerals like iron, zinc molybdenum etc are required in very minute doses, (even in micrograms), are known as micro-nutrients. 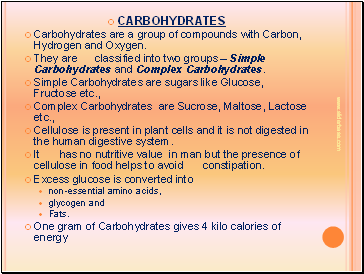 Carbohydrates are a group of compounds with Carbon, Hydrogen and Oxygen. They are classified into two groups – Simple Carbohydrates and Complex Carbohydrates. Cellulose is present in plant cells and it is not digested in the human digestive system. It has no nutritive value in man but the presence of cellulose in food helps to avoid constipation. Sucrose is called cane sugar. If we eat only rice, only carbohydrates are supplied to the body and body building materials (proteins) will be deficient. If we eat only proteins, body will be built up but for daily metabolic activities, energy will not be supplied. Hence for healthy growth, all type of nutrients are required for the body. 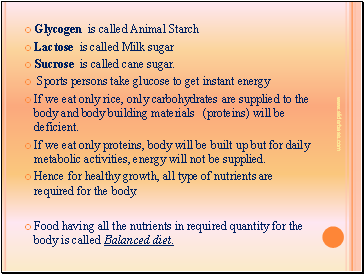 Food having all the nutrients in required quantity for the body is called Balanced diet. Proteins are body building substances with Carbon, Hydrogen, Oxygen, Nitrogen. and Sulphur in small amounts. 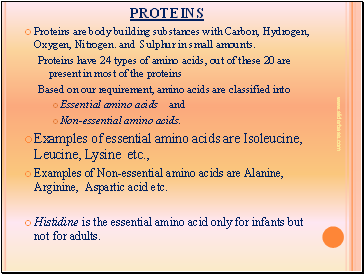 Examples of Non-essential amino acids are Alanine, Arginine, Aspartic acid etc.